I saw the signs for Lexington on I75 while driving back from the 2013 RWA conference in Atlanta. I’d been admiring the beautiful countryside when I passed the exit for Man O War Boulevard. Suddenly there’s a new story in my head. It’s a paranormal. I don’t do paranormal. I already had one finished book that needed polishing before publishing and two more in various stages. But some things you just can’t control and I couldn’t make the story go away. By the time I reached Cincinnati I had a book to get on paper. But to my chagrin, it was a story about a ghost horse . . . really? I wrote the first draft and decided that someday I’d get around to the research needed to make my premier thoroughbred horse farm believable. Race ahead three years and I’m working out the details for coming down to the Kentucky Horse Park for the Retired Racehorse Project. 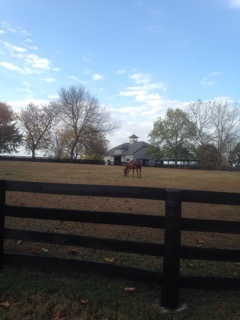 I’d be working the CANTER booth for four full days so just maybe I’d have time to visit one of the farms in Lexington. I was given the contact information for a “friend” of CANTER who may be able to help me with research for the book that I didn’t have time to finish. CANTER Ohio had two of our adopters who were competing, Smuggler’s Hold (polo) and One Wild Kitty (dressage) so I spent my days between manning the booth and racing back and forth to the barns for photos and visiting. By Saturday morning I’d crossed off trying to call my horse farm contact. But heck, it would be at least a year before I could get around to finishing a story about a ghost horse. Today was grueling and I was exhausted after dismantling the booth and loading the vehicles. I had just one more thing left to do before heading out and that was to finish conversations I’d had with an organization where we have a horse in permanent retirement. Hot, sweaty, and out-of-breath I arrived at their booth to find they’re talking to a lovely woman with a warm, infectious smile. Yep . . . she was the contact I’d given up of ever finding. We had a great chat and she’s intrigued with the story. We’ve made plans for me to come back next summer, after the foaling and breeding season in the spring. She suggested that I check out the Keeneland library tomorrow for history on the thoroughbred racing industry. That darn ghost horse is back in my head. Serendipity has, once again, stepped in. I think a ghost is telling me that he wants his story told.